As Halloween season quickly approaches, thoughts turn to the supernatural, the undead, and the downright creepy. But, really, regardless of the season, is there anything scarier than a haunted house? From coast to coast, homes that boast a little paranormal activity abound, attracting curious ghost-hunters who hope to catch a glimpse of someone or something from the great beyond. There’s still time to plan a spooktacular road trip. Let’s take a look at some of the most legendary haunted houses you may want to check out this season. Read on if you dare. What took place inside this Long Island estate is so chilling, it inspired a book and multiple films. In 1974, six members of the DeFeo family were found shot to death inside this stately home. Ronald DeFeo Jr., 23 at the time of the brutal killings, was later convicted of murdering his parents and four siblings. Though the home sold a year after the grisly killings, the new owners quickly moved out citing unusual odors, sudden, unexplainable cold drafts, and a ghost that appeared to be half-demon-half pig. But despite all that bloody history, the five-bedroom waterfront home has had numerous owners since. It was back on the market in 2016, listed at $850, but sold in February of 2017 for $605,000. This otherwise-attractive plantation in St. Francisville, Louisiana is considered to be “one of the most haunted houses in America.” Since it was built in 1797, the sprawling southern estate has been home to multiple owners as well as countless deaths and murders. Today, visitors have an opportunity to take a day or evening tour, or even stay over at the bed and breakfast for a chance to sample a side of the occult with their coffee and pastries. Legend has it that in addition to ghost sightings, a grand piano has been known to play sans musician, and furniture has rearranged itself. Definitely intriguing. Located in Salem, Massachusetts, one of the most haunted locales in the United States, the Joshua Ward House has earned a reputation for inhabiting the spirit of none other than George Corwin, the High Sheriff during the Salem Witch Trials. Corwin, aka “the Strangler,” is said to be responsible for the gruesome killings of more than a dozen men and women he suspected of practicing witchcraft. Legend has it, Corwin’s body was buried in the basement of the three-story Federal style brick house. Visitors say Corwin and the ghost of one of the warlocks he killed at this location haunt this home. New Orleans’ French Quarter is home to the LaLaurie Mansion, where a socially prominent couple, Dr. Louis and Delphine LaLaurie, lived with their daughters during the 1830s. It was inside this three-story Creole mansion that Delphine reportedly tortured slaves, causing one to jump to her death. The house, which was owned by actor Nicolas Cage from 2007 to 2009, is said to be haunted by screams of terror emanating from the ghosts of Delphine’s slaves. Life magazine named the St. Louis-based Lemp Mansion one of the America’s most haunted houses in 1980. Built in the 1860s, it was the home of brewing magnates who had a history of suicide in the family. In fact, three are said to have died inside the home, which currently houses a restaurant where murder mystery dinner theater takes place. Paranormal tours are offered as well. This Queen Anne-style Victorian is known as the most haunted home in Ohio. While he lived there, Hans Tiedermann, a German immigrant, lost multiple children under mysterious circumstances. Despite the charm of the exterior, the Cleveland-based home is said to be filled with spirits. Located in Falls River, Massachusetts, the Lizzie Borden house is where, in 1892, Borden was believed to have murdered her father and step-mother with an axe in their home. Though she was acquitted, Borden was never able to shake her reputation as a cold-blooded killer. Those who are brave enough can visit this home, now a bed and breakfast, and stay in the room where the couple slept or the room where Borden’s step-mother was found after the grisly murder. This Staten Island, New York home has been the site of multiple deaths, including a suicide and a murder. The otherwise-charming Victorian is said to be haunted by the spirits of those who died within its confines. Despite its history, the home, set on five acres, was listed at $9.5 million in 2016. Ghosts included. 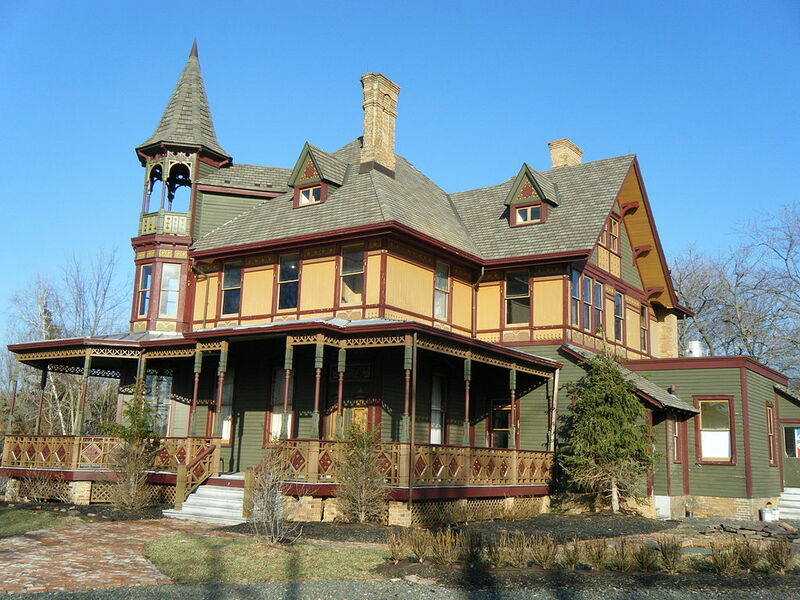 This Bucks County, Pennsylvania inn reportedly receives frequent visits from its most famous ghost, Emily, the daughter of a previous owner, who lived in room 6 and died in that very room as well. Capitalizing on its haunted history, the inn hosts monthly dinners featuring a medium who delivers messages from beyond. Intrepid guests can spend the weekend and even sleep in room 6 where visitors have noted the scent of smoke, which could be attributed to the military men who once stayed there during the 1700s, and flowers, a favorite decoration of Emily’s. Filled with dark passages and spider web windows, this home in San Jose, California has had millions of visitors pass through its spooky hallways. Guests can take part in a Friday the 13th flashlight tour or a Halloween candlelight tour and see if they discover any of the phenomenons that have made the house infamous with mystery lovers and fans of unique architecture alike. This Old Town San Diego-based home is said to be among the most haunted in the U.S. as it’s the site where a northern criminal named Jim Robinson was hanged. To this day, he’s said to haunt the home, which you can tour — if you’re feeling brave. Known for its innovative architecture and beautiful but haunted spiral staircase, the Octagon Museum in Washington D.C. is said to be haunted by at least two ghosts. One is believed to be Dolly Madison, while the other is the daughter of a colonel who fought with her father about her love for a British soldier and fell to her death in that famous staircase. Located in New Albany, Indiana, this stunning mansion will have you swooning over that Mansard roof, but what lurks inside? Well, for starters, there’s occupied coffin in the cellar. Creeped out yet? Even scarier, lightening struck the property’s carriage house in the 1880s, killing everyone inside. Those who lost their lives are said to haunt the place ever since. Brave souls who aren’t frightened by ghosts can rent the space for balls or even tea parties. Or, simply take a tour and revel in the architecture and perhaps the supernatural. Do fresh cookies sell a home??? Posted on October 23, 2018 October 18, 2018 Tags #homesmell #cookiessmell #cleanhome #Seguinrealestate, #whatshouldmyhousesmelllikeLeave a comment on Do fresh cookies sell a home??? Real Estate – Best Investment! The results are in: the best long-term investment you can make? Real Estate. Each year, Gallup surveys Americans to find out what they believe to be the best investment options for building long-term wealth. And in their most recent survey, Americans overwhelmingly chose real estate, making this the fifth year in a row real estate tops the list. Thirty-four percent of Americans surveyed chose real estate as the best long-term investment option for building wealth, which is nearly ten percentage points ahead of the next investment choice on the list, stocks (which came in at 26%). The results of the Gallup survey, and the fact that real estate has been chosen as Americans’ top investment choice for five years running, is a clear indicator that faith in the real estate market has bounced back since the Great Recession (when gold was a much more popular investment option). With consumer confidence clearly indicating stability in the market, there’s never been a better time to purchase a home—and make a long-term investment in your future. Posted on October 19, 2018 October 18, 2018 Tags #investmymoney #realestateinvestor #realestate #seguinrealestateLeave a comment on Real Estate – Best Investment! If you’ve been on the fence about purchasing a home because you’re unsure of the market, it might be time for you to take a cue from the majority. According to the National Association of Realtors’ most recent Housing Opportunities and Market Experience (HOME) Survey, nearly 70% of Americans believe that now is a good time to purchase a home. This buyer confidence is likely due to a number of factors, but one of the main factors at play is likely the upcoming increase in available inventory. According to a recent report on new constructionfrom the US Census Bureau and the US Department of Housing and Urban Development, builders completed new homes at a record rate in May 2018 (a seasonally adjusted rate of nearly 1.3 million) and approved another 1.3 million building permits—which means a ton of new inventory is about to flood the market, making it significantly easier for potential buyers to find and purchase homes. If you’ve been thinking about purchasing a home, it looks like it’s time to make a move and take advantage of what 70% of Americans believe to be a good time to purchase property. Posted on October 4, 2018 September 29, 2018 Tags Buying my first home in Texas, Geronimo, Geronimo Real Estate, Katie Clark Realtor, Melissa Trost REALTOR, Navarro Real EstateLeave a comment on Now is the time to buy!